I have an office in my house that I write in. I have a huge monitor so that I can see a lot of pages up on the screen at once, and also because my eyes are so bad I now work in 200% view. I’m surrounded by my books and the paraphernalia they’ve created – Descendants stuffed toys, Poisoned Apple stress balls, foreign editions, fan gifts, etc. 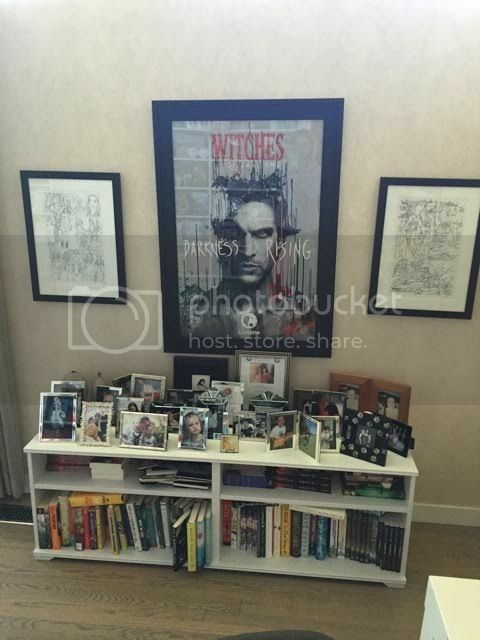 I have a big poster of our TV show – Witches of East End that Lifetime sent me. I have a photo of Truman Capote in his office. I like the contrast between his office and mine. Other things in my office that are framed is the letter from Disney VP and Publisher Jeanne Mosure when Van Alen Legacy was one of the most successful books of 2009 for Disney-Hyperion. The letter came with a VIP pass to Disneyland, which they renew every year. BOOM!  Very proud of that. My office is a bit cluttered and messy, but it’s my space, and I actually need to look at the wall when I’m writing, I can’t look out at a view, it’s too distracting. Also my dog Mimi sleeps in my office, so she’s my buddy, my office mate. I’m never alone.